In the 20 years since our founding, a lot has changed. Our communities face different health challenges, and new policies mean new successes and new barriers to confront. Evolution and adaptation are absolutely necessary if we want to achieve our mission of making our health care systems work for all Coloradans. One of the shifts we’ve made to increase our impact in a changing state is to work more closely with Coloradans to empower them to advocate for themselves. We’ve also looked carefully at the messages we send to our stakeholders. 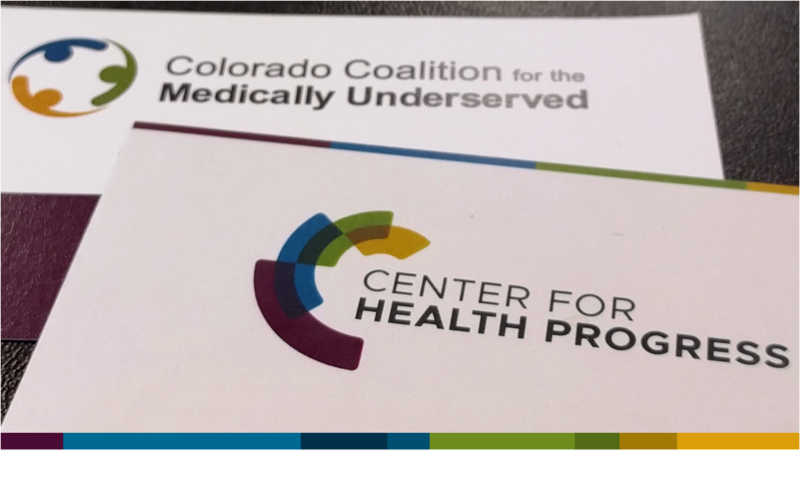 What we’ve learned is that, despite decreasing barriers to health and health care access, our old name, Colorado Coalition for the Medically Underserved, had become a barrier in distinguishing us from the many health care advocacy organizations in our state and to being approachable to the everyday Coloradans we now call partners. Our new name, Center for Health Progress, reflects the collaborative nature of our work. “Center” communicates the way we work together to ensure our health care system works for all Coloradans, and “Health Progress” is a reminder of the goal of our efforts. Our new name embraces the role we play as leaders and conveners among the many health care advocacy organizations in our state, helps us be more approachable to all Coloradans, and reflects our optimism for the future. What hasn’t changed—and will never change—is our commitment to bringing people together to change the systems that deliver health to Coloradans. Our purpose, our mission, and the way we conduct our work remain the same. Thank you for your support over the past two decades! We’re glad to be sharing this milestone with you!